Eddy J. Moors is Head of the research group Climate Change and Adaptive Land & Water Management (CALM) of Alterra Wageningen UR. 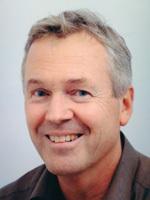 He is also professor of Water and Climate at VU University, Amsterdam, the Netherlands. Before coming to Wageningen he worked for the World Meteorological Organization in Africa and the Caribbean. His key expertise is integrating disciplines to tackle research questions that ask for an inter- and transdisciplinary approach. Keywords in his research are: climate change, adaptation, greenhouse gas emissions, and stakeholder interaction. He is and has been coordinator of national and international projects. He is among others member of the Hotspot Team of the city of Rotterdam and is member of the Adaptation Services Platform of Climate KIC.